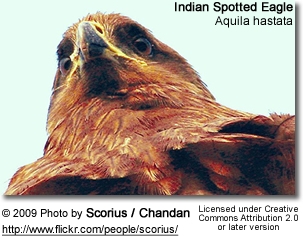 The Indian Spotted Eagle (Aquila hastata) is a large South Asian bird of prey. Like all typical eagles, it belongs to the family Accipitridae. The typical eagles are often united with the buteos, sea eagles and other more heavyset Accipitridae, but more recently it appears as if they are less distinct from the more slender accipitrine hawks than believed. The Indian Spotted Eagle is about 60 cm in length and has a wingspan of 150 cm. It is broad-headed, with the widest mouth of all spotted eagles. This species has a lighter coloration overall compared to its relatives, with a darker iris that makes the eyes appear darker than the plumage (rather than the other way around as in the northern spotted eagles). Adults can be told apart from the Greater Spotted Eagle by its lighter color, darker eyes, and habitat preferences. Juveniles, unlike the Lesser and Greater species, are not strongly spotted at all, making the common name somewhat misleading, and also lack the creamy buff nape patch of the juvenile Lesser Spotted Eagle. This eagle is found in lightly wooded habitats in India. This species can often be approached quite closely for a large raptor. 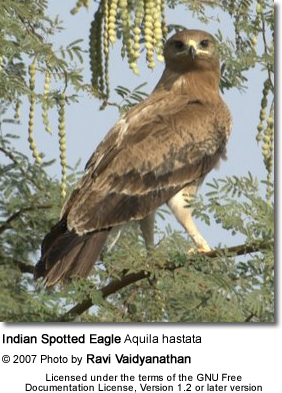 Unlike the Greater Spotted Eagle which is a winter visitor to Indian wetlands, this species does not show any special affinity for wetland habitats. The Indian Spotted Eagle was earlier considered the resident eastern subspecies of the Lesser Spotted Eagle but has proven quite distinct and readily separable by morphological, behavioral, ecological and DNA sequence data. The Indian lineage seems to have diverged around the middle Pliocene, perhaps some 3.6 million years ago, from the common ancestor of the Lesser and Greater Spotted Eagles. The "proto-Spotted Eagle" probably lived in the general region of Afghanistan, being split into a northern and a southern lineage when both glaciers and deserts advanced in Central Asia as the last ice age began. The spotted eagles as a group are quite distinct from the typical members of Aquila, the "true eagles". They will probably be separated in Lophaetus, Ictinaetus or a genus of their own in the near future.